Not to be confused with the neighboring province of Shanxi (Shānxī Shěng, 山西省) whose capital is Taiyuan. "West of the Shǎn (Pass)"
Shaanxi (pinyin: Shǎnxī; Mandarin pronunciation: [ʂàn.ɕí] ( listen); formerly romanised as Shensi) is a province of the People's Republic of China. Officially part of the Northwest China region, it lies in central China, bordering the provinces of Shanxi (NE, E), Henan (E), Hubei (SE), Chongqing (S), Sichuan (SW), Gansu (W), Ningxia (NW), and Inner Mongolia (N). It covers an area of over 205,000 km2 (79,151 sq mi) with about 37 million people. Xi'an – which includes the sites of the former Chinese capitals Fenghao and Chang'an – is the provincial capital. Xianyang, which served as the Qin dynasty capital, is located nearby. The other prefecture-level cities into which the province is divided are Ankang, Baoji, Hanzhong, Shangluo, Tongchuan, Weinan, Yan'an and Yulin. 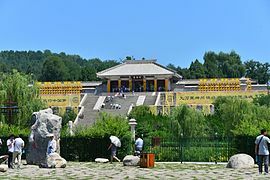 Shaanxi comprises the Wei Valley and much of the surrounding fertile Loess Plateau, stretching from the Qin Mountains and Shannan in the south to the Ordos Desert in the north. Along with areas of adjacent Shanxi and Henan provinces, it formed the cradle of Chinese civilization, with its Guanzhong region sheltering the capitals of the Zhou, Han, Jin, Sui, and Tang dynasties in addition to the Qin. It does not include the full territory of the Yellow River's Ordos Loop, with the Great Wall of China separating it from the grasslands and deserts of Inner Mongolia. The name "Shaanxi" is an irregular romanization of the Mandarin pronunciation of the Chinese name 陕西, meaning "[Land] West of the Shan Pass". This pass in Henan, now part of Sanmenxia's Shanzhou District, was considered to be the place where the Yellow River left the Loess Plateau and entered the North China Plain. Because the Mandarin pronunciation of Shaanxi and its eastern neighbor Shanxi differs only in tone, their spelling in pinyin romanization differs only by tone marks (Shǎnxī and Shānxī, respectively). The People's Republic of China therefore adopted the special official spelling "Shaanxi". The first syllable is derived from Gwoyeu Romatzyh romanization, which reflects the tones of the words' vowels in their spelling. The second syllable—which would be shi in Gwoyeu Romatzyh—is instead given its usual pinyin spelling xi. When tone marks are noted, it is spelled Shǎnxī rather than Shǎanxī or Shaǎnxī. Before the adoption of pinyin, Shaanxi was romanized as Shensi in the Chinese postal romanization scheme. Shaanxi is considered one of the cradles of Chinese civilization. Thirteen feudal dynasties established their capitals in the province during a span of more than 1,100 years, from the Zhou dynasty to the Tang dynasty. The province's principal city and current capital, Xi'an, is one of the four great ancient capitals of China and is the eastern terminus of the Silk Road, which leads to Europe, the Arabian Peninsula and Africa. Under the Han dynasty, the Northern Silk Road was expanded to advance exploration and military purposes to the west. This Northern Silk Road is the northernmost of the Silk Roads and is about 2,600 kilometres (1,600 mi) in length. It connected the ancient Chinese capital of Xi'an to the west over the Wushao Ling Pass to Wuwei and emerging in Kashgar before linking to ancient Parthia. Under the Ming dynasty, Shaanxi was incorporated into Gansu but was again separated in the Qing dynasty. One of the most devastating earthquakes in history occurred near Hua Shan, in south-eastern part of Shaanxi Province on January 23, 1556, killing an estimated 830,000 people (see 1556 Shaanxi earthquake). The end of the short-lived Jiangxi Soviet signalled the beginning of the Long March by Mao Zedong and the Chinese Communists to the Shaanxi Soviet at Yan'an. The Lantian Man site, with hominin fossils of one million years ago, was found in Lantian County in northwestern Shaanxi province, near the city of Xi'an. Scientists classify Lantian Man as a subspecies of Homo erectus. The fossils are displayed at the Shaanxi History Museum, Xi'an, China. The geography of the area is described as being part of the Ordos Desert in the north along the border with Inner Mongolia, the Loess Plateau in the central part of the province, the Qin Mountains (Qinling) running east to west in the south central part, and subtropical climate south of the Qinling. In between the Loess Plateau and the Qinling lies the Wei River Valley, or Guanzhong, a cradle of early Chinese civilization. Going clockwise, Shaanxi borders Shanxi (E, NE), Henan (E), Hubei (SE), Chongqing (S), Sichuan (SW), Gansu (W), Ningxia (NW), and Inner Mongolia (N). In terms of number of bordering provincial-level divisions, Shaanxi ties Inner Mongolia. Due to its large span in latitude, Shaanxi has a variety of climates. Under the Köppen climate classification, the northern parts, including the Loess Plateau, have either a cold arid (Köppen BWk) or cold semi-arid (Köppen BSk), with cold and very dry winters, dry springs and autumns, and hot summers. The area known as Guanzhong is mostly semi-arid, though there are a few areas with a humid subtropical climate (Köppen Cwa), with cool to cold winters, and hot, humid summers that often see early-season heatwaves. The southern portion is much more humid and lies in the humid subtropical zone, with more temperate winters and long, hot, humid summers. Annual mean temperature is roughly between 8 to 16 °C (46 to 61 °F), with January temperatures ranging from −11 to 3.5 °C (12.2 to 38.3 °F) and July temperatures ranging from 21 to 28 °C (70 to 82 °F). Besides the provincial capital of Xi'an, other cities include: Baoji, Hanzhong, Lintong, Tongchuan, Xianyang, Yan'an and Ankang. The ten prefecture-level divisions of Shaanxi are subdivided into 107 county-level divisions (30 districts, 4 county-level cities, and 73 counties). ^ a b New districts established after census: Gaoling (Gaoling County), Huyi (Huxian County). These new districts not included in the urban area & district area count of the pre-expanded city. ^ a b Yangling is a satellite urban area separated from Xianyang and it is not included in the urban area & district area count. ^ a b New district established after census: Hengshan (Hengshan County). The new district not included in the urban area & district area count of the pre-expanded city. ^ a b New district established after census: Nanzheng (Nanzheng County). The new district not included in the urban area & district area count of the pre-expanded city. ^ a b New district established after census: Huazhou (Huaxian County). The new district not included in the urban area & district area count of the pre-expanded city. ^ a b New district established after census: Ansai (Ansai County). The new district not included in the urban area & district area count of the pre-expanded city. ^ Shenmu County is currently known as Shenmu CLC after census. ^ Binxian County is currently known as Binzhou CLC after census. The politics of Shaanxi is structured in a triple party-government system like all other governing institutions in mainland China. The Governor of Shaanxi is the highest-ranking official in the People's Government of Shaanxi. However, in the province's dual party-government governing system, the Governor is considered to have less power than the Shaanxi Communist Party of China Provincial Committee Secretary (中共陕西省委书记), colloquially termed the "Shaanxi CPC Party Chief"; since the Governor is always ranked as the First-Deputy Secretary in the Shaanxi Communist Party of China Provincial Committee. Shaanxi was established as a provincial government since Qing dynasty. On 10 January 1950, the People's Government of Shaanxi was established in Xi'an. Ma Minfang was then appointed as the first Governor of Shaanxi. Established in 1992, Baoji Hi-Tech Industrial Development Zone was approved as a national hi-tech zone by the State Council. It has a long-term planned area of 40 km2 (15 sq mi). The transportation system around the zone includes Xi'an-Xianyang International Airport and National Highway 310, and industries operating within the zone include auto parts, electronics, IT, pharmaceuticals and bioengineering industries and new materials. Shaanxi Xi'an Export Processing Zone (XEPZ) was approved on 21 June 2002 by the State Council for its establishment and was put on 5 April 2004. As the first state-level export processing zone in northwest China, XEPZ has become one of the seven pioneer EPZs with the function of bonded logistics in China. XEPZ is under the leadership of the Administrative Committee of Xi'an Economic and Technological Development Zone (XETDZ), which is designated by Xi'an municipal government to exercise economic and administrative power within the zone. XEPZ is a special economic zone. By now, there are more than 40 enterprises home and abroad settled in XEPZ. The pillar industries feature aviation, machinery, electronics and new energy. The Western Triangle is a new economic zone composing the three major city-level economies of Western China: Xi'an, Chongqing and Chengdu. It is believed that the addition of Xi'an to the Triangle will spur economic growth in the region and allow the city an opportunity to capitalize on the commercial potential of its high-technology industries. Established in 1993, Xi'an Economic and Technology Development Zone was approved as a national zone in 2000. The zone is 20 minutes from Xi'an Xianyang International Airport, and national highways pass through. It has formed four pillar industries: automotive, electronics, food, and new materials industries. So far, the zone has attracted more than 1,700 enterprises. 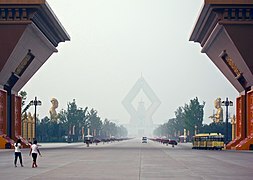 Xi'an HTDZ opened its gates in 1991. It was established as a "pivotal location" for investment by high-tech industry companies in central and northwest China. Established in 1991, Xi'an Hi-Tech Industrial Development Zone is a national high-tech zone. It is surrounded by national highways and it is 30 minutes from Xi'an International Airport. 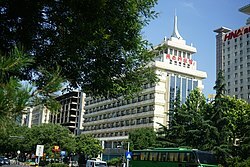 Furthermore, it is ranked in the top three high-tech zones in China. Xi'an Software Park, established in December 1998, is the professional park for Xi'an to develop scale software and service outsourcing industries. The park has been appraised as a software industry base under the National Torch Program, national software industry base, national software export base, city demonstrational area of national service outsourcing base. It is one of the four parks with "double bases" of software in China. Xi'an Software Park assembles 90% of enterprises engaging in software and service outsourcing in Xi'an. There were nearly 780 companies, of which foreign-funded enterprises account for 170, and over 71,000 jobholders in the park by the end of 2008. Yangling Agriculture Hi-Tech Industrial Zone was approved as a national-level hi-tech development zone by State Council in 1997. It is 82 km (51 mi) from Xi'an to the east and 70 km (43 mi) from Xi'an Xianyang International Airport. Nearly all the people in Shaanxi are ethnic Han Chinese, with pockets of Hui population in the northwestern region (adjacent to Ningxia). Shaanxi province is one of the centers of ancient Chinese civilization. The southern part of Shaanxi, known as Guanzhong, where the provincial capital Xi'an is located, is more populated compared to the northern part. Xi'an part of Shaanxi Province until 1947; dissolved in 1954 and incorporated into Shaanxi Province. The predominant religions in Shaanxi are Chinese folk religions, Taoist traditions and Chinese Buddhism. According to surveys conducted in 2007 and 2009, 7.58% of the population believes and is involved in ancestor veneration, while 1.57% of the population identifies as Christian. The reports didn't give figures for other types of religion; 90.85% of the population may be either irreligious or involved in worship of nature deities, Buddhism, Confucianism, Taoism, folk religious sects, and small minorities of Muslims. Temple of the Chenghuangshen (City God) of Weinan. Guangren Temple of the Tibetan Buddhist tradition in Xi'an. Road to the stupa of the Famen Temple (Chinese Buddhist). Temple of Xuanyuan in Huangling, Yan'an. Qinqiang, the representative folk opera of Shaanxi. Mount Hua, one of the five best known mountains in China. Taibaishan (Mount Taibai), the highest peak of the Qinling Range. Shaanxi Radio serves Xi'an and the surrounding Shaanxi province area with music, and news. The Story of Yue Fei, a 17 – 18th century wuxia fiction novel about the life of Song dynasty general Yue Fei, says his military arts teacher, Zhou Tong, was from Shaanxi. Chinese Super League: Shaanxi Renhe Commercial Chanba F.C. ^ 陕西省2017年国民经济和社会发展统计公报 [Statistical Communiqué of Shaanxi on the 2017 National Economic and Social Development] (in Chinese). Statistical Bureau of Shaanxi. 2018-03-09. Retrieved 2018-06-22. ^ Roberts, Edmund (1837). Embassy to the Eastern Courts of Cochin-China, Siam, and Muscat. New York: Harper & Brothers. p. 123. ^ a b c "China Economy @ China Perspective". Archived from the original on 2011-10-08. Retrieved 2011-10-25. Wikimedia Commons has media related to Shaanxi. Wikivoyage has a travel guide for Shaanxi.